Benign prostatic hyperplasia (BPH) is an enlargement of the prostate gland characterized by overgrowth of the transitional and periurethral area, resulting from the proliferation of stromal and epithelial glandular cells. It is the most common nonmalignant condition of the prostate in aging men and its incidence increases from 50% at the age of 50 years to 80% over the age of 80. The etiology of this nonmalignant disease is still far from being fully understood and, as a direct consequence, it is difficult to identify an effective therapy. BPH represents a significant burden in aging men frequently associated with LUTS, which may impair quality of life. The principal hypothesis for the hyper- trophic reaction of prostate tissue is steroid-mediated cellular proliferation. Recent findings have provided an evidence-based thesis that strongly suggests a role of inflammation in the pathogenesis of BPH. A role for inflammation in the development and pathogenesis of BPH has been proposed. An examination of baseline prostate biopsies in a subgroup of 1197 patients in the Medical Therapies of Prostate Symptoms study found that there were chronic inflammatory infiltrates in most of the men. The inflammatory cells may trigger a sophisticated and well-orchestrated inflammatory cascade, resulting in exaggerated oxidative stress, activation of the transcription factor nuclear factor-kappa B (NF-KB), production of several cytokines and overexpression of inducible-cyclooxygenase (COX-2), inducible-nitric-oxide-synthase (iNOS) and 5-lipoxygenase (5-LOX), leading, in turn, to the release of prostaglandins, nitrates, and leukotrienes. Furthermore, inflammatory cells produce growth factors, such as vascular endothelial growth factor (VEGF) and transforming growth factor (TGF-b), which may support fibromuscular growth in BPH. If inflammation is associated with the pathogenesis, symptoms, and progression of BPH, then drugs for the treatment of BPH and LUTS should have a large anti- inflammatory activity. The treatment of BPH and lower urinary tract symptoms (LUTS) includes: adrenergic receptor antagonists, 5 alfa reductase inhibitors, and plant extracts, or phytotherapic agents. For many decades, plant extracts have been some of the most popular drugs used in the medical management of BPH-induced LUTS; their pharmacologic use for the medical management of BPH is common. Serenoa repens (SeR), derived from the berries of the saw palmetto tree, is the most popular naturally derived medication for BPH and the most widely used among the several phytotherapeutic agents available for the treatment of BPH. Several mechanisms of action have been proposed to explain its therapeutic efficacy, including inhibition of 5 alfa-reductase and dihydrotestosterone binding to androgen receptors, a weak alpha adrenergic receptor antagonism, inhibition of growth factors–induced prostate cell proliferation, and inhibition of COX-2 and 5-LOX. The most proposed are antiestrogenic and antiandrogenic effects and anti-inflammatory activity. This last activity, in light of the key role played by inflammation in the pathogenesis of BPH, should be emphasized. In agreement with this idea, SeR is often administered together with LY and Se in the effort to increase its therapeutic activity. Both lycopene (LY), a dietary carotenoid synthesized by plants, fruits, and microorganisms with a strong antioxidant activity, and selenium (Se), an essential trace element mainly functioning through selenoproteins and able to promote an optimal antioxidant/oxidant balance, have been shown to exert beneficial effects in BPH. However, epidemiologic evidence show that lycopene may reduce BPH symptoms or incidence, whereas there is no solid scientific evidence supporting selenium use in the treatment of BPH. Nevertheless, because selenium has antiinflammatory and antioxidant activities, it is reasonable to hypothesize that there is also a beneficial effect in BPH. It has been hypothesized that SeR, Ly, and Se, administered together, might amplify their therapeutic efficacy on the proliferative and inflammatory component of BPH. In fact the lycopene- Se-Serenoa repens combination has greater, enhanced anti-inflammatory activity, which might be of particular interest for benign prostatic hyperplasia treatment. Prostate enlargement induced by testosterone has been used to assess the effects of potential treatments for BPH since it reproduces adequately but not fully the major features of human BPH, including functional and histological changes. This supports the theory that testosterone produces prostate hyperplasia. Results of many studies show prominent prostate growth after testosterone administration and a consequent increase in prostate weight with the typical histological features of BPH. Combined treatment with Ly-Se-SeR was more effective than SeR treatment alone in preventing BPH and it inhibited growth by 83%, suggesting that Se and Ly at pharmacological doses further increase SeR efficacy for BPH. The administration of a triple combination of these compounds in rats according to the dose used in humans was generally safe and well tolerated. Nevertheless, some authors reported no effect of SeR compared with placebo in clinical trials; thus, there is still a need for answers to the possible effective use of this agent in BPH. Despite the substantial quantity of clinical research on saw palmetto, there is no clear-cut evidence of potential benefit associated with its use. The reason for this discrepancy might be that much of the available research has serious methodological problems, including lack of an active control and short duration of the trials. In this regard, the mechanism of action of SeR is still far from being fully understood. Nevertheless, some studies have focused on the mechanism of action of the association ser-ly-sel, highlighting the effectiveness. Prostate growth inhibition by Ly-Se-SeR is likely stimulated via a caspase dependent signal through caspase-9 and an independent mechanism involving the pro-apoptotic Bax and the anti- apoptotic Bcl-2 genes. To date 3 major apoptotic signaling pathways have been described, including the mitochondrial pathway, the endoplasmic reticulum pathway and the death receptor pathway. Bcl-2 and Bax are key in apoptotic events. Bcl-2 is an upstream effector molecule in the apoptotic pathway that was identified as a potent suppressor of apoptosis. Most cancers, including prostate cancer, generally over express Bcl-2 thereby escaping apoptosis and undermining therapy. Bcl-2 forms a heterodimer with the apoptotic protein Bax, neutralizing its apoptotic effects. The ratio of these proteins determines whether a cell will commit to the apoptosis pathway. Many studies reported that Ly-Se-SeR was more efficient than SeR alone in significantly down-regulating Bcl-2 protein and up-regulating Bax during hormone dependent, testosterone induced BPH. The endoplasmic reticulum, caspase driven cascades can be activated by multiple pathways, including the mitochondrial pathway, which relies on cytochrome c release and, thus, activates the initiator caspase-9. In several studies SeR and particularly the Ly-Se-SeR combination induced caspase-9 over expression in prostate tissue, further stimulating the apoptotic machinery triggered by the Bax/Bcl-2 imbalance. Also, Bcl-2 staining was noted to be intensified in the area of chronic inflammatory infiltrate in radical prostatectomy specimens. This potential concomitant decrease in inflammation, which parallels the increased apoptotic activity in BPH tissue, is supported by our previous findings in the bladder obstruction model, in which we observed a significant decrease in inflammatory infiltrate and tumor necrosis factor, an important BPH inflammatory marker. Inflammatory cells release cytokines as well as growth factors to modulate the immune response but they also promote epithelial and stromal prostatic cell growth. Growth factors have a significant role in the regulation and growth of normal, hyperplastic and malignant prostatic epithelium. Prostatic cells alone secrete inflammatory mediators and stimulate their own growth. After the circle has started it appears that feedback controls can be overwhelmed and prostate volume progressively increases. SeR decreases in vivo the androgenic support to prostatic cell growth and induces a 50% decrease in DHT and EGF in BPH tissue in treated patients. In agreement with these findings we noted that during testosterone induced growth there was over expression of the growth factor EGF, which was prevented by treatment with SeR and to a greater extent by combined Ly-Se-SeR. EGF activates intracellular signaling cascades to initiate activation of the downstream pathways that lead to cell proliferation, migration, adhesion, anti-apoptosis, angiogenesis and metastasis. Moreover, EGF and its receptor EGFR are frequently over expressed in prostate cancer, which is associated with a more aggressive clinical outcome. Among other growth factors involved in BPH and cancer development a primary role is played by VEGF, which stimulates neovascularization. VEGF has been observed in BPH stromal cells as well as in prostate cancer epithelial cells, where it has a significant role in tumor growth, inducing angiogenesis. Recently VEGF was noted to be a possible therapeutic target to reduce prostate growth. Accordingly in our experimental model we observed a sustained anti-VEGF effect of SeR, particularly when combined with Se and Ly. This indicates an antiproliferative effect independent of hormone receptor status, which consequently might be useful for different pathological conditions. The Ly-Se-SeR association more efficiently reduced oxidative stress/lipid peroxidation in rat peritoneal macrophages challenged with LPS, thus suggesting that the combination of compounds may have a more powerful antioxidant effect. Oxidative stress can trigger an inflammatory cascade in which NF-κB plays a prominent role. In unstimulated cells, NF-κB is constitutively localized in the cytosol as a heterodimer by physical association with IκB-α. After activation, the NF-κB heterodimer is translocated to the nucleus, where it activates the transcription of target genes, including cytokines, chemokines, and COX-2 and iNOS. The association of LY-Se-SeR caused a greater inhibitory effects on IκB-α loss from the cytoplasm and NF-κB activity in LPS-stimulated macrophages than those observed with the single compounds. Activation of NF-κB regulates the expression of several genes, which include enzymes, such as iNOS, which is involved in inflammation and cellular injury. Activated macrophages transcriptionally express iNOS, which catalyzes the oxidative deamination of L-arginine to produce nitric oxide and is responsible for prolonged and profound production of nitric oxide. Our results clearly show that the association of LY-Se-SeR attenuated more efficiently than the single compounds the increase in either iNOS expression or nitric oxide content induced by LPS, probably through NF-κB activity inhibition. TNF-α is another NF-κB product that has a crucial role in the inflammatory cascade. Analizing the message for TNF-α in LPS-activated MΦs, was found that The association of LY-Se-SeR reduced the levels of TNF-α mRNA more efficiently than the single compounds. The LY-Se-SeR antiinflammatory activity may therefore lie in mechanism(s) simultaneously combining a balanced inhibition of COX-2/5-LOX to the blockade of the NF-κB-primed inflammatory cascade. The greater efficacy of the LY-Se-SeR association was confirmed in rats with partial bladder outlet obstruction. 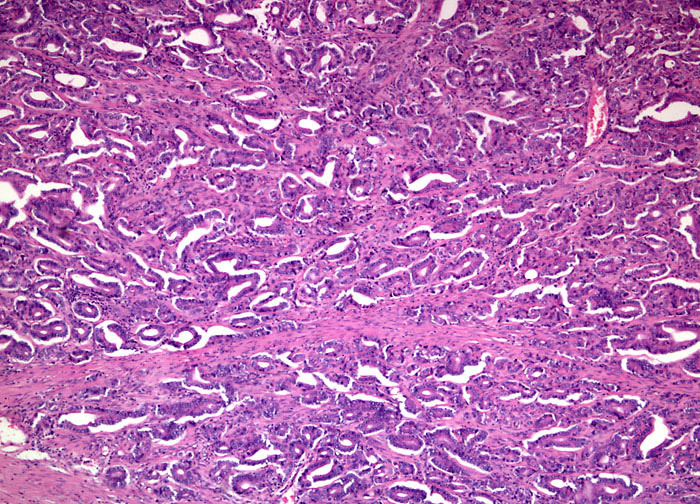 After surgery, the prostate undergoes hyperplasia and a proinflammatory phenotype characterized by an increased expression in TNF-α, VEGF, and TGF-β mRNA and MDA levels. The association of LY-Se-SeR reduced prostate proinflammatory phenotype, as well as hyperplasia, more efficiently than the single compounds. Indeed, the effects observed on VEGF could be antagonized by androgens that inducing the growth of the prostate gland may directly or indirectly increase VEGF; however, this hypothesis deserves further experiments in different BPH experimental models. In the present paper, the observed decrease in VEGF expression after bladder outlet obstruction together with the reduced inflammatory response might, at least in part, explain the positive effects obtained by treating the animals with LY-Se-SeR. The Ly-Se-SeR association was more effective than SeR alone for inducing the apoptosis that was likely to occur via caspase-9 and Bax activation, and consequent inhibition of the Bcl-2 pathway in testosterone induced BPH. Ly-Se-SeR also more efficiently inhibited prostate enlargement by inhibiting growth factor expression, suggesting a possible alternative therapy for hormone dependent prostatic growth.